A beautifully designed chrome finished Corner Entry Pacific Shower Enclosure. The Aegean collection is a classic range of showering options combining both style and practicality, with outstanding value. With a wide variety of designs and styles to choose from, most showering needs can be met within the Aegean collection. Hi, Thank you for your question, this enclosure does not come assembled. Q. The glass appear foggy in picture, is that the case? Hi, The glass on this quadrant shower enclosure is clear glass. Thank you for your question. Q. What are the dimensions? Is it 90cm x 90cm? The Aegean Shower Enclosure is available with dimensions of either 90 x 90 cm or 80 x 80 cm to accommodate different bathroom sizes. Hope this helps. Fitter says good quality with exception of screws - but no different to problems with other makes he has fitted. Tenants seem happy with look & quality. My wife and I are delighted with this purchase, the installation of which has significantly improved the appearance of our ground-floor shower room,which now has a more contemporary look. Selecting the appropriate model from the catalogue and ordering on line could not have been easier,the price was competitive and delivery both speedy and efficient. We only regret not having made this change many years ago. 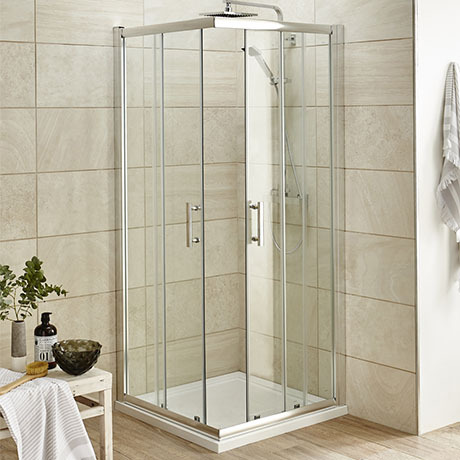 Renewing the ageing bathroom in our home, this shower enclosure is excellent value for money and has clean, sleek lines making it look quite contemporary. After researching online to find all round best value for money, this is the enclosure I chose. We live out in the sticks and this can pose a problem with delivery,but not on this occassion which was fabulous.